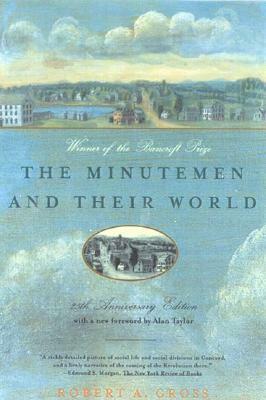 The Minutemen and Their World, first published in 1976, is reissued now in a twenty-fifth anniversary edition with a new Foreword by Alan Taylor and a new Afterword by the author. On April 19, 1775, the American Revolution began at the Old North Bridge in Concord, Massachusetts. The "shot heard round the world" catapulted this sleepy New England town into the midst of revolutionary fervor, and Concord went on to become the intellectual capital of the new republic. The town--future home to Emerson, Thoreau, and Hawthorne--soon came to symbolize devotion to liberty, intellectual freedom, and the stubborn integrity of rural life. In The Minutemen and Their World, Robert Gross has written a remarkably subtle and detailed reconstruction of the lives and community of this special place, and a compelling interpretation of the American Revolution as a social movement. Massachusetts generated some of the most ardent patriotism before the Revolution and it was in Massachusetts that the first shots were fired in anger. The battles of Lexington and Concord, fought on April 19, 1775 near Boston, were the first military engagements of the American Revolution.